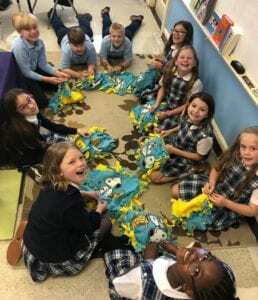 Immaculate Conception Cathedral School’s Mindfulness Club members made Easter pillows this week for families who might not be able to provide baskets or special gifts for their children. Making the kits was also a chance for them to practice one of the skills enhanced through mindfulness — concentration. Students focused intently on the task, making sure the material was lined up correctly as they created the pillows. In addition to improving concentration skills, mindfulness helps children improve emotion regulation and mood as well as to develop empathy, confidence, self-esteem, and social skills.